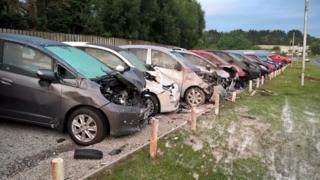 A woman has died after a car careered off a main road and smashed into a row of 22 parked cars on a garage forecourt. A black Vauxhall Vectra saloon left the A390 near St Austell in Cornwall just after 21:45 BST on Sunday, police said. The female passenger, who was in her 40s, died at the scene while the male driver was taken to hospital with "serious significant" injuries. The road was closed for eight hours for investigations. Officers say they are appealing for witnesses to the crash at Andrew Toms Cars at Hewas Water.